Before I get too far into this post I need to offer a disclaimer: this photo was not taken with my 50mm lens (cue sad trombone). I used my 35mm f/1.8 which, because I shot this on my crop-sensor Nikon D7100, could be argued is actually closer to a true 50mm lens than my actual 50mm lens. But math and semantics aside, I just want to make sure to get this out of the way right upfront lest I be taken to task for misleading anyone. Truth be told the physical focal length of this 35mm lens makes its optical properties quite different from a 50mm lens, and it’s not just in terms of the strict field of view. There’s also issues like background compression, focusing distance, minimum aperture, etc. that make this lens dramatically different from its slightly more telephoto counterpart. So why am I posting it here on my blog dedicated to shots taken with my 50mm lens? The answer lies in the purpose behind this blog in the first place: this image illustrates what can happen if you stop letting your camera collect dust on the shelf and take it out to snap photos. And since this blog serves as a public space for me to keep pushing myself as a photographer and keep my camera in my hands and not in a closet somewhere, I thought it a fitting place for this image despite the fact that I took it with my 35mm lens. When I took this image I was on my way home from Lincoln, Nebraska a few weeks ago. I went back home for the funeral of my best friend’s father who passed away from ALS, and I decided to get a very early start on my return trip to Oklahoma the following day. I wanted to get back to my wife and kids, and also leave a bit of wiggle room for pictures along the way. (My go-to travel kit is my D7100 + 35mm lens, because it works great for so many photographic situations from people to nature to architecture to anything in between.) That’s one of the nice things about road trips: photo opportunities abound if you’re willing to look for them, stop, and get out of your car. I took Highway 77 south out of Lincoln and as I crept up on Beatrice I saw a gorgeous sunrise on the horizon, so I pulled over, grabbed my camera, and took several shots. 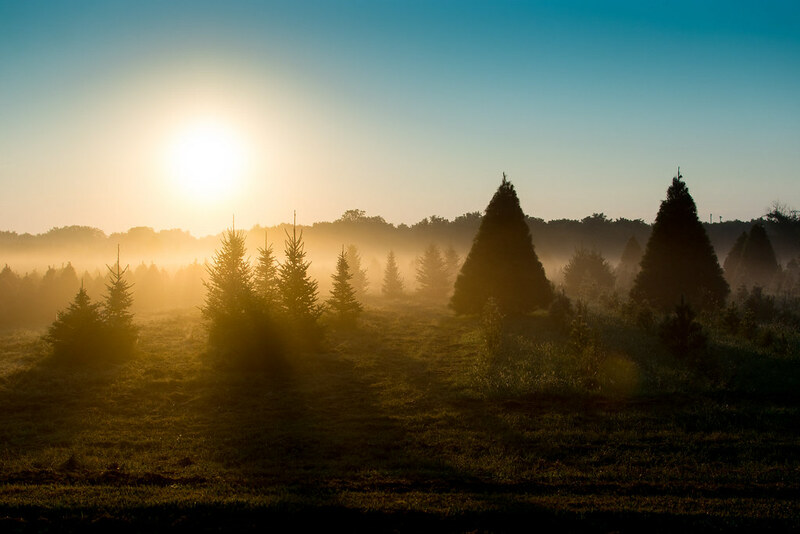 A half hour later as the sun was a bit higher in the sky I passed what I think was a Christmas tree farm south of Wymore and saw a field of young pines silhouetted in the morning fog, backlit by the rising sun. And I kept on driving. Thankfully before I had gone even a half mile down the road I decided that all these reasons were patently ridiculous so I found a dirt road, turned around, and drove back to the tree farm. I pulled off the road, got out my D7100, and took a dozen shots before getting back in my car and continuing my seven-hour drive back home. In the end I’m so extraordinarily glad I took a few minutes out of my day to get this image. Every one of the reasons I found to not stop and take a photo seems entirely trivial compared to the picture I got, and even if I didn’t manage to capture a decent shot I would still have had a fun little experience. And sometimes that, my friends, is worth a thousand photos. OK, so, since you started the conversation, how do the 50mm 1.8 and the 35mm 1.8compare. I am also shooting on a crop sensor. I have a 50 for my Canon Rebel, but I was recently given a Nikon D3100. I want to find a prime lens for it, and I am open to suggestions. I love the photo you took, so glad you went back. You captured my favorite time of the morning, Not quite the golden hour, the misty hour. I don’t know if there’s a good 35mm option for your Canon Rebel, but you really can’t go wrong with the 35mm 1.8G for your Nikon D3100. It’s an outstanding all-purpose lens and will suit almost any situation you’re in except for sports or ultra wide-angle photos. I highly recommend it! Simon, I thought about this conversation, did some research, and decided to go for the 35mm 1,8. Hopefully, by the first of the year I can upgrade my hand-me down Nikon 3100 to the 5500 I really want. After that, I’ll save my pennies for a full frame. Thanks for the camera talk! Wow!!! What a great shot! First, you are forgiven for using a 35mm f1.8 lens. I have one also for my D7100 and I think it is a pretty good lens to carry around the city. Second, the photo is superb. Rule of Thirds puts the sun in the proper place and there is the surreal effect of the morning fog swirling through the pine trees. I can almost see the moisture from the dew on your shoes! Thank you for reminding us that we have to have our cameras with us in order to capture these moments. Well done, Simon. Thank you for your comments David, and for absolving me of any guilt from using my 35mm lens :) I didn’t know you had a 35mm lens too, and I hope you are able to find time to get out and shoot pics with it. That lens is easily my favorite, mostly because it’s just so practical in so many situations. I wonder what it would be like using a CR filter on your 35mm? What an absolutely stunning shot! You have inspired me to both take my camera along and stop!